Current legislation demands, not only that most premises are equipped with emergency lighting, but also that all systems are regularly tested and maintained. Since the installed emergency lighting luminaires and signs automatically self-test in excess of the requirements of the UK and European Standards, there is no need for any local staff to carry out manual testing. The FASTEL SRM offers not only a solution that ensures continuous compliance with legislation but also alleviates the need for significant capital expenditure to provide it by offering a leased, fully maintained system. Normally based on an agreement for five years, P4 leased SRM installations are ideal for premises such as schools, healthcare centres and smaller commercial and industrial premises where there are limited resources that can be regularly devoted to emergency lighting testing or maintenance. Our fully maintained lease provides peace of mind that the responsibility to ensure the installation is tested, maintained and always available, is delegated to P4 system experts. Fully automatic self-testing emergency lighting incorporating a central monitoring facility in accordance with ATS type PER classification, as classified by BS EN 62034. Individual luminaires incorporate self-contained emergency lighting operation with built-in standalone self-testing in accordance with ATS type S, as classified by BS EN 62034 and facility for connection to a central monitoring and control facility by an unscreened two wire communications bus operating at a nominal voltage of 28v d.c.
Loss of connection of the communications bus to a luminaire causes that luminaire to revert to standalone self-testing operation. The condition of each luminaire is automatically recorded by the central monitoring facility and also indicated locally at the luminaire. Failure of any luminaire during testing or the failure of the supply to the central monitoring facility is signalled via a GSM link to designated email recipients and as SMS messages to designated recipients. 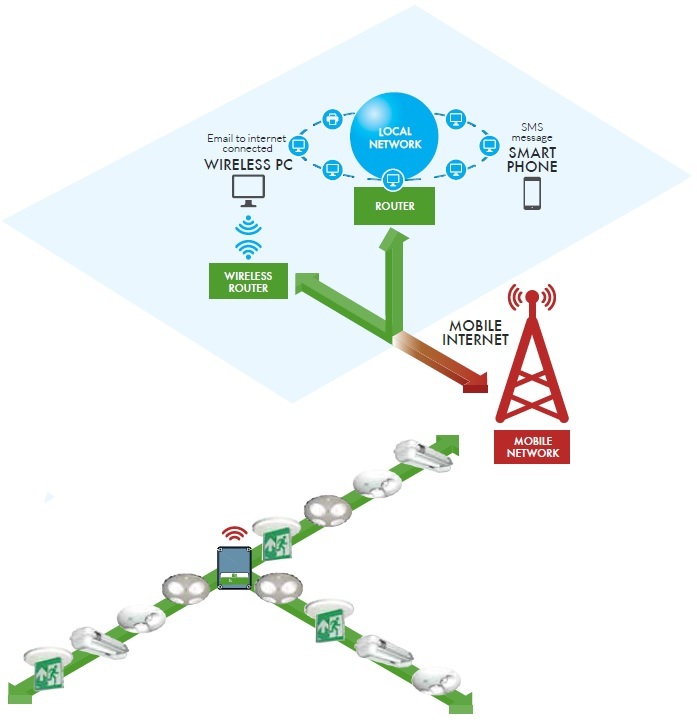 A monitoring service may be designated to receive messages and provide a maintenance service. 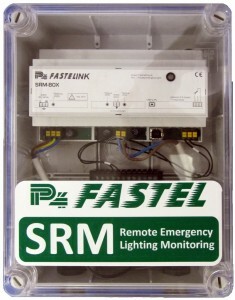 As Fastel SRM – remote emergency lighting monitoring technology.